Mt. Hood Outfitters is your local guide for beginner to expert level mountain biking on & around Mt. Hood Oregon. Our Tour Guides have firm knowledge of the many miles of mountain bike trails that wind down & around Mt. Hood. Depending on trail conditions (whether the snow has melted or not!) there a few Tour options from which to choose. 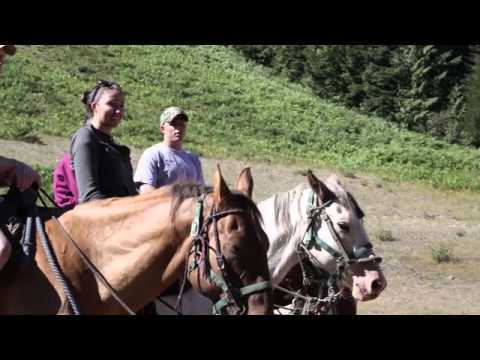 The Pioneer Bridle Tour connects the towns of Government Camp to Rhododendron with either our private shuttle or the local Mt. Hood Express Bus transporting you back up to our shop after you 9 exhilarating miles down the hill. The Bike the Volcano Tours offer a fun & explosive mountain bike adventure that begins at Timberline Lodge with the option to go slower & less distance or extend it all the way down to Trillium Lake. No need to huff and puff on this one as we shuttle you to 6000′ elevation to start your 2000′ cruise back to Government Camp. Follow your friendly guide as you explore the Mt. Hood National Forest, stopping to get the best views and learning about this dormant volcano! Along the way you will also hear about the all the trees, plants, wildflowers, and wildlife that inhabit the area. All Tours include your bike, helmet, & expert interpretive Tour Guide. Contact us at 503-715-2175 or email info@mthoodoutfitters.com for more details.